Instant Book Writing Kit is a comprehensive step-by-step "how-to" book-writing manual that reveals previously unknown secrets about how to make money online with a book or eBook using the little known Online Publishing Model. 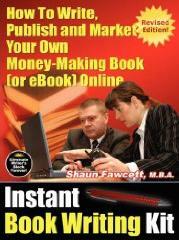 Instant Book Writing Kit - REVISED EDITION is a complete revision and update of the original best-selling edition. It is a comprehensive step-by-step "how-to" book-writing manual that reveals previously unknown secrets about how to make money online with a book or an eBook (i.e. via the Internet) using the little known Online Publishing Model (OPM). Written by an author who has successfully published more than a dozen books⁄ebooks online; it shows you EXACTLY how to write, publish and market your own book⁄ebook using the three key online distribution channels; rather than via the old money-losing traditional book publishing model. The Kit's unique 17 Action Steps For Online Publishing Success provide a step-by-step blueprint that explains exactly how ANY aspiring author and⁄or self-publisher can implement this breakthrough model and make significantly more money than they would using the conventional book publishing method. Anyone wanting to create a quality book⁄ebook and make some decent money from it will definitely want access to this valuable information. Linda P. Burke of Vincennes, IN USA says,"This book is a perfect blueprint with step-by-step instructions on how to go about writing, publishing, and marketing your very own online book/ebook creation. I've been searching for and purchasing books and courses that promised such services, but they all fell short. Well, this one truly delivers and then some! "I was feeling overwhelmed, confused, and unsure what to do next until I found Shaun Fawcett's resources, and now I am completely certain that if I follow his well thought out and tried and tested plan, I can and will achieve the same success that he has. "His integrity and wisdom shine through. This is for sure the best 47 bucks I've invested since the beginning of my book-writing endeavor. Do yourself a favor and buy this book! Thank you, Shaun, for producing such a long overdue and invaluable tool!" After self-publishing two non-fiction books using the conventional publishing model, this author decided that he had to find a more efficient and profitable way to distribute and market his books. This book is a step-by-step account of the actual publishing model that this author developed by trial and error while writing, publishing, and marketing seven books⁄ebooks in less than two years. The author has dubbed this new online approach (i.e. via the Internet) the "Online Publishing Model".